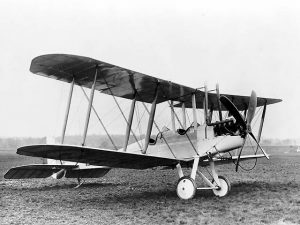 Bellasize opened in April 1916 and was used by 33 Squadron (Home Defence), Royal Flying Corps, with their BE2c aircraft from April to October 1916. The site was also used during the autumn of that year by Avro 504s of 76 Squadron (Home Defence) Royal Flying Corps. Whose task was to help protect the Humber Estuary and the approaches to the industrial North, the River Humber was a favourite route, probably due to ease of navigation, by Zeppelin crews heading inland. 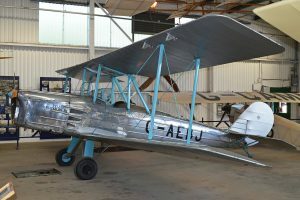 Sited between the A63 and the river Ouse, the airfield was subject to flooding and saw little use during WW1. It was listed as a 1st class landing ground and covered 33 acres. During WW2 the airfield was again requisitioned by the Air Ministry and reopened in November 1939 and was brought onto use as a relief landing ground for No 4 Elementary flying training school at Brough. Owned and operated by Blackburns. The RLG at Bellasize was used by the Blackburn B2’s of 4 EFTS, being joined by Tiger Moths of the same unit. The B2’s were phased out in 1942 leaving the Tiger Moths to operate, It had a single runway of approximately 2,000 ft, Bumps and scrapes were frequent, the trainee pilots not being helped by the site’s propensity to flooding from the nearby River Ouse (Bellasize is only 12 feet/3 m above sea level) and autumn and winter mists until July 1945, when the airfield officially closed. On 18th May 1943 this aircraft was struck by Tiger Moth N9189 at Bellasize airfield and was badly damaged, T7777 was either parked on the ground awaiting take off or had just taken off when it was struck by N9189. The wreckage of both aircraft caught fire and as a result three airmen died, the two flying instructors listed below are credited on the RAF’s crash card as being in T7777. Flying Instructor – F/Lt Kenneth Reavley Mason RAFVR (66563), aged 29, of Willesborough, Kent. Buried Elloughton Churchyard, Yorkshire. Flying Instructor – F/O Harold Rathbone RAFVR (112726), aged 31, wife of Richmond, Surrey. Buried Hull Western Synagogue Cemetery, Yorkshire. On 18th May 1943 the pilot of this aircraft was attempting to overshoot a landing at Brough but collided with Tiger Moth T7777 either on the ground or in the air just after N9189 had left the ground. Both aircraft were badly damaged when the wreckage caught fire and as a result three airmen died. Pilot – Sgt John James Cooper RAFVR (1214085), aged 20, of Alwoodley, Leeds. Buried Armley Cemetery, Leeds, West Yorkshire (Sec.F/Grave 871). © RAF Badges and other Crown Copyright material is reproduced with the permission of and under the terms of a licence issued by the Directorate of Intellectual Property Rights, Ministry of Defence. Photographs marked ‘© IWM’ are used with the permission of the Imperial War Museum and may not be copied without the permission of the IWM.